I love starting plants with growlights! Here are some new tomato plants for an early spring greenhouse. These were grown in small trays under the grow lights that I got for Christmas last year. They have not yet seen sunlight. I will probably move them to the greenhouse in a couple of weeks when our fall tomato crop is through bearing. I am so impressed on how good our plants look germinating and starting their life under the lights. I also have lettuce, spinach, Kale and Swiss Chard started for an early spring garden. I plan to grow lettuce under them during the hot summer time when it's too hot to grow lettuce outside. Here is Sveta picking and eating some of the cherry tomatoes in the greenhouse. Already time for early Spring transplanting! 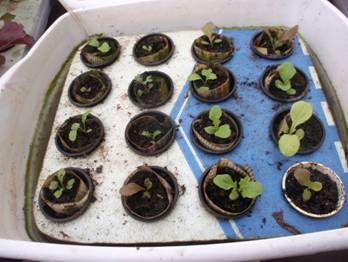 On January 5, I started some broccoli, cauliflower and letter for our early spring garden under my grow lights. Within a week, the plants were already up and ready to be separated. I was shocked at how many seeds germinated. I think it was 100% So I made some newspaper pots and separated them out. 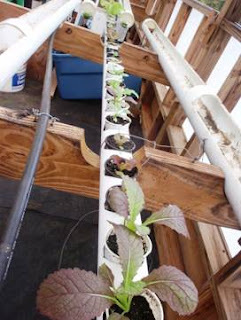 I cleaned out or fall lettuce and placed as many in the tubes to grow as I can. The rest I put into treys to water by hand. The other side of our greenhouse tubes is full of broccoli ready to harvest. I was shocked that I think I have over 150 broccoli plants and a couple dozen cauliflower. We love broccoli but I may have to give some plants away! They are perking up quickly. I also cleaned out our lettuce. I had about 4-5 cuttings off of them. Look at the roots they generated! Even the little broccoli plants were about 1" tall but had 3-8" roots already growing. You can see one of our floating beds of lettuce still has some to harvest in the next week or two. Otherwise, I have new lettuce starting. We put water with organic nutrients in the bottom. . .
We use a fish aquarium aerator in the water and put styrofoam on top where I set the plants in. It is a great system! You watch it grow and harvest! Here's my greenhouse harvest from Saturday, January 4th! 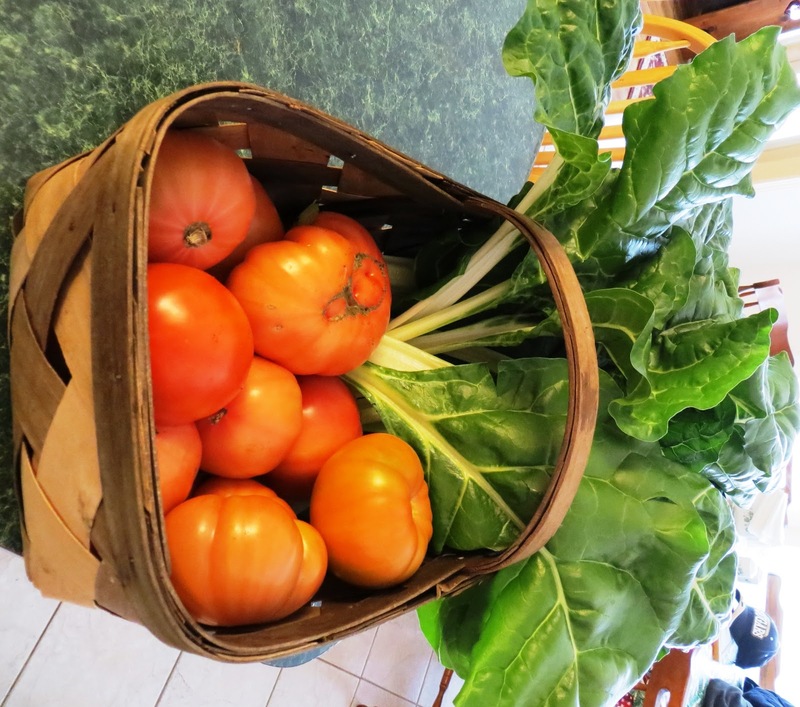 Almost 1/4 bushel of great tasting, organically grown greenhouse tomatoes and Swiss Chard! This fall's tomato crop is wonderful and we should have tomatoes for four more weeks! Our broccoli in the greenhouse is almost ready as we are finishing up the broccoli from the fall garden. It has been tremendous! One of our days in Florida was spent in Orlando. First we went to the Orlando temple so Grandpa and Grandma could watch the kids while the others went to the temple for a session. The kids really enjoyed looking at the temple and going around the grounds. We took the kids to a nearby park that had a wonderful playground. Afterwards we enjoyed lunch and since we have a lot of Lego lovers, we went to the Lego store at downtown Disney to show them the huge Lego creations! Here is Andrew flexing his Hulk muscles and Matthew and Ethan looking mean! Here are the girls with their poses! Of course they did have some huge Lego creations outside! and even in the water! Florida Christmas Trip - Brevard zoo! After Christmas, the South Carolina Harper's went to visit with Kevin and family in Florida. The weather was cool for Florida but warmer than South Carolina and we all had a great time. We took time to go to the Brevard Zoo, which is a beautiful place. They have lots of exotic birds and in the bird cage, we were able to feed them a little nectar! Even when you didn't they would land on you. It was wonderful! Here are some more birds: We have a Katy bird. . .
an Ethan bird. . .
a Maggie bird. . .
an Andrew bird . . .
a Matthew bird. . . It was decorated for Christmas. We also found some turtles! Here are Eric and Tracy's family at the end of the day! All of the kids had a wonderful day! This is my harvest from our greenhouse this morning. Our fall Greenhouse tomatoes are wonderful and a lot of fruit was set. The greens are Swiss chard, the largest leaves from two plants. Our greenhouse broccoli is starting to head. What good food! Here is some of our fall broccoli just coming to heads! It has done wonderful this fall. In fact this head measured over 8 inches! Talk about fresh, I picked it, cooked it and ate it within about two hours of time. 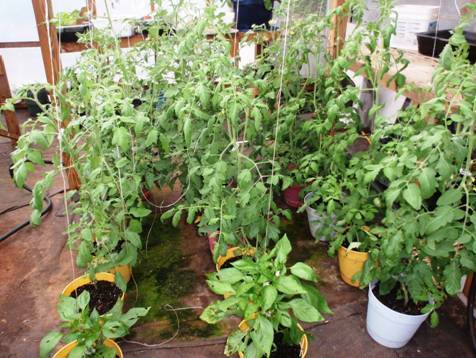 We tried to keep our fall tomatoes going longer by making a "tent" for them on frosty nights. It worked pretty well. At night we put in a couple of lights and it worked really well. 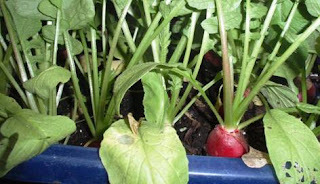 In the greenhouse, we have had two crops of radishes. They are quick and easy to grow. 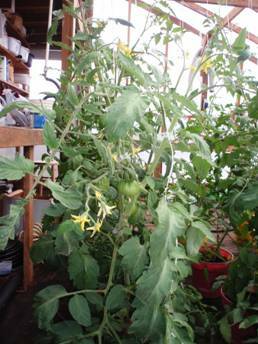 The tomato plants inside the greenhouse set fruit and are starting to ripen. Our lettuce is doing wonderful. We have several leaf lettuce varieties and it grows back quickly. I know that this is late getting posted but Happy 1st Anniversary to Ryan and Sveta! We kept the top of their wedding cake in the freezer so on their 1st anniversary, they came over have it to celebrate this milestone. It wasn't too bad old or dried out and was enjoyable the second time! In fact, they said they really didn't have a piece the year before! The rest of the pictures are from our greenhouse! I’ve been harvesting radishes and they grow quick. I just put them in a plastic container with holes in the bottom for drainage. Here is some of our floating leaf lettuce. 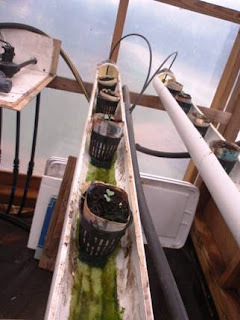 When doing these, we just have a nutrient reservoir below Styrofoam. The cups are 2” so Michael made 2” holes and they are 2” a part. The plastic container is just a dishpan. We also got some air rocks that you use in an aquarium to oxygenize the air. The larger lettuce on the right is loose head varieties. Since they larger, they are 6” a part. The plastic container is one that would fit under the bed. I painted it black because of light issues. Again, the nutrient reservoir is below. We also got a 2” PVC pipe and cut about 40 two inch holes in it and placed some lettuce to grow there. This part of our greenhouse has four PCV pipes that have a pump and then drain into a 15 galloon plastic container. 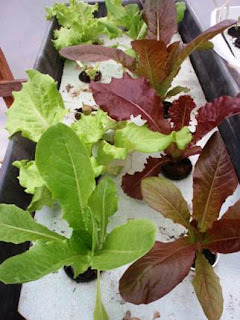 We have not done lettuce this way in the past but wanted to see how it compared with the other way we do it. We do put in broccoli, cauliflower, cabbage, etc. Those pipes are 3” wide. Michael just cut them down but we have decided we would rather have 3” holes a foot apart and will do that in the future. 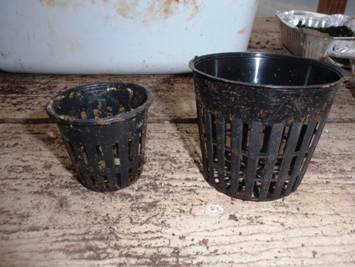 For the grow cups, I like to use newspaper cups and some soil. The soil helps keep the roots damp in case something goes wrong with either electricity loss or nutrient loss. I like the mesh pots to put the newspaper pots into to hold them in place. The roots grow right through the newspaper and the holes in the pots. The newspaper also acts as a wick to pull up the water and nutrients. For the lettuce, we have used bathroom size plastic cups and cut with a hole in the bottom and holes around the sides but I think the roots go out easier with the newspaper and mesh. In fact, you will see roots a foot long! Here are our greenhouse tomato plants. We started these August first and they are setting fruit and are about four feet. They are just in pots and about once a week when I redo the nutrient reservoir, I will use those nutrients to water the tomatoes otherwise I water daily. I also have a couple of pepper plants that I started as new plants. We use technaflora fertilizer. They have three main components, boost, grow and then when it’s setting fruit you use bloom instead of the grow. It is an organic fertilizer and I like it. It stays fairly stable in measuring the parts per million, unless it is hot and then I may have to add water. One gallon will last a long time. I do use a water meter to measure how much parts per million it has and try to keep it at about 500. I am enclosing you a handout on mixing but find it doesn’t use as much as it calls for to make it at 500. 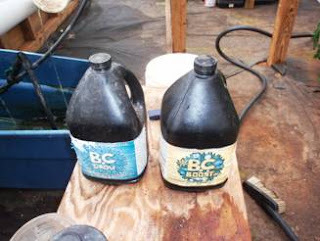 I mix in a 5 gallon bucket and use 2 T of boost and then 1 T of grow and mix that and then add about 2 ½ gallons more to get it to 500. I will also be putting herbs in the greenhouse. Right now they are in pots on our deck closer to the kitchen. We have tried to garden most of the year and in January we will start early crops to put out the end of February and later start spring plants. We pretty much eat something from our garden almost daily. Sweetie to my sweetie, Mom, grandma, sister, friend, small business co-owner of Transcription Network, Inc., RS Pres. Life is but a Scream!